In honouring of the role of music as a powerful vehicle for communicating messages, UN Women and the Embassy of Canada to Thailand hosted the UN Secretary-General’s UNiTE to End Violence against Women Song Contest. This international competition ran from 25 November 2016, the International Day for the Elimination of Violence against Women, and ended on 8 March 2017, International Women’s Day. 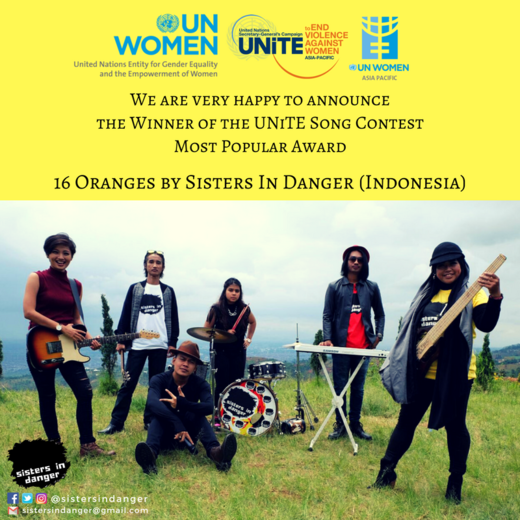 We are very happy to announce the winner of the #UNiTEsong Most Popular Award is Sisters in Danger “16 Oranges”, Indonesia. Congratulations for your amazing creation! Musicians from around world participated in the UNiTE Song Contest, including India, Haiti, Mongolia, Pakistan, United States and Viet Nam. UN Women and the Embassy of Canada to Thailand would like to thank everyone who participated in the UNiTE Song Contest. UN Women and the Embassy of Canada to Thailand would like to thank everyone who participated in the UNiTE Song Contest.